Marcel Duchamp’s “Fountain” Has Defined the Direction of Art. Marcel Duchamp’s famous “Fountain”. Drawing by Kit White. Marcel Duchamp was born on this day in 1887 (July 28, 1887 – October 2, 1968). It became a good media tradition to commemorate great people – artists, scientists, writers – on their birthdays. Among many geniuses, Marcel Duchamp is absolutely worth a note because he is perceived as one of the most provocative artists ever. A lot of people would think of that notorious urinal which became an artwork called “Fountain” (1917). And yes, probably this is the most provocative and scandalous art object. 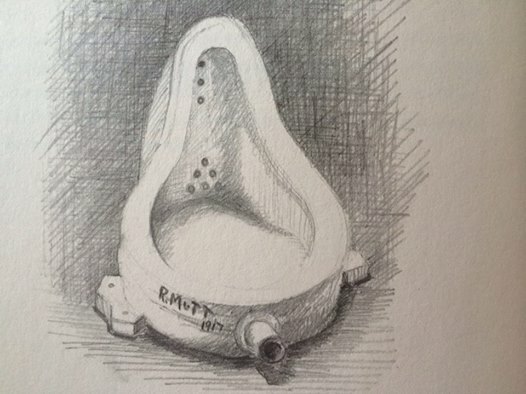 Duchamp purchased that standard urinal in a hardware store and then submitted it for the annual exhibition of the American Society of Independent Artists. The object was rejected for its indecency and even plagiarism: the commission explained that it was a work of a plumber but not an artist. Why would Duchamp do it? Because he was questioning the very essence of “art”: what is art? Can an ordinary object be nominated as art? Is “art” something appealing to the eye or to the mind? “Fountain” is considered one of the most prominent artworks ever, which defined the moment and transformed the direction how art is viewed and perceived. “The creative act is not performed by the artist alone; the spectator brings the work in contact with the external world by deciphering and interpreting its inner qualifications and thus adds his contribution to the creative act.” – Marcel Duchamp. ← Bushwick is a New Montmartre!